Finally, Oppo has launched its Reno series of devices which has been in the leaks from a long time now. This all awaited device comes with 10x lossless zoom camera technology which was showcased at MWC 2019. Oppo has now launched three different variants of the Reno smartphone with periscope style zoom camera. 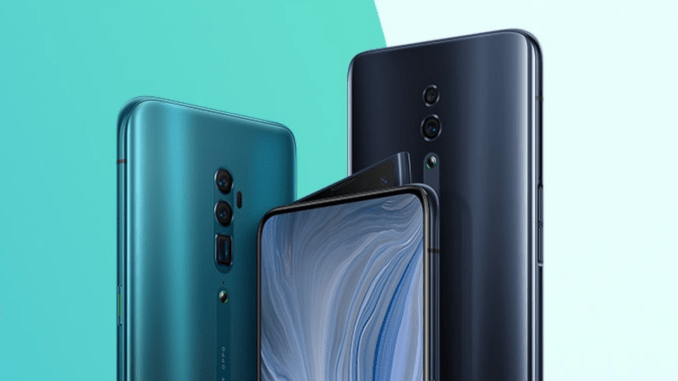 Oppo has showcased three different variants of the device in China, namely Oppo Reno 10X Zoom, Oppo Reno 5G, and a cheaper variant Oppo Reno Standard. The smartphone comes with 3D glass body and Oppo has added O-Dot ceramic point below that rear camera to protect the camera lens. The bigger Oppo Reno 10X Zoom variants come with the 6.6-inch display while the other variant sports 6.4-inch display. Both the variants will be using AMOLED screens and will be protected with the latest Corning Gorilla Glass 6. These smartphones also use a new-generating in-display fingerprint sensor that increases the unlocking speed by 28.5 percentage. Furthermore, the device also comes with full view display without any notch or bezels and comes out of the box with Android 9.0 Pie operating system with ColorOS 6 on top. Furthermore, Oppo is also bringing its own voice assistant Breeno and also introducing Game Boost 2.0 mode along with TouchBoost and FeameBoost technologies for the gamers. The bigger 10x zoom variant comes with 7nm Qualcomm Snapdragon 855 Mobile Platform, the standard variant is powered by the 10nm Qualcomm Snapdragon 710 Mobile Platform. Oppo has provided the Reno 10x zoom and Standard variant with 3765mAh and 4065mAh batteries respectively and will also be coming with Oppo’s fast charging technology. Coming to the camera’s, the bigger device will be sporting a 48MP Sony IMX586 primary sensor coupled with the 13MP periscope-style telephoto sensor and an 8MP ultra-wide-angle camera on the back and comes with the features like dual OIS and triple focus for capturing stable photos. It also has 16 mm to 160 mm focal length which gives up to 10x lossless zoom. It also provides five different portrait options in the camera app and can record 4k videos in 60fps with 3D audio using 3 microphones for surround sound effect. The Oppo Reno 10x Zoom variant is priced at CNY 3999 for the 6GB + 128GB variant while the 6GB + 256GB variant is priced at CNY 4499. The 8GB RAM along with 256GB storage is priced at CNY 4799. On the other hand, the Oppo Reno standard variant is priced at CNY 2999 and CNY 3299 for the 6GB + 128GB and 6GB + 256GB storage respectively. The 8GB RAM + 256GB storage variant is priced at CNY 3599 and will be available from April 19th in China. 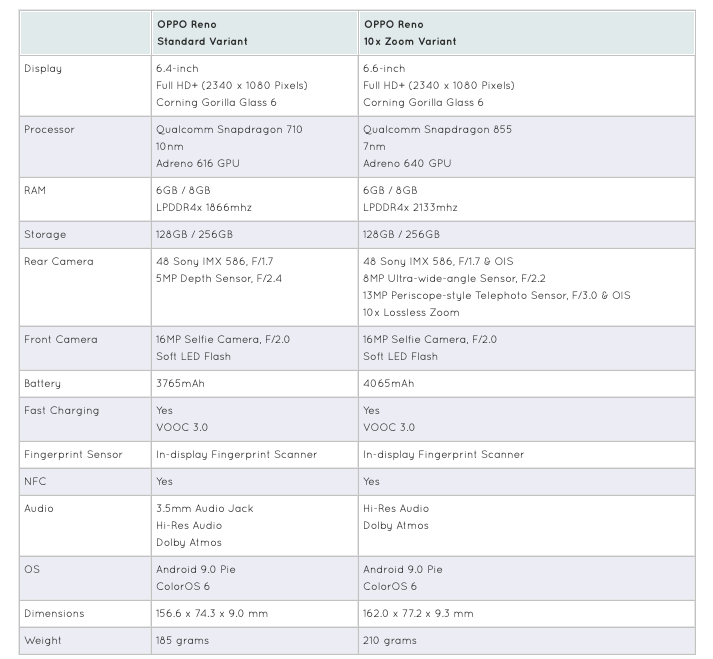 What are your views on these handsets? Are you planning to get one? There is also a 5G variant of the Oppo Reno which was announced today. Comment in the section below if you have more queries on the same and stay tuned to Android Advices for more.